Two rows from @infinite_canvas. 2016 - present. Many details would escape even the most discerning eye. In this image the traditional candles are from a Gerhard Richter painting. The other ones above and to the left are from an Anselm Kiefer painting. The third are a piece of a Robert Irwin light sculpture photographed at DIA Beacon and then turned into candles. The infinity symbol is Fischli and Weiss from their Guggenheim retrospective. The "cannon" is made from a sculpture from the MET Breuer melded with a photograph from DIA Beacon. There's also a Dan Flavin light and my own drawing. @infinite_canvas is an ongoing digital collage work that addresses the limitations of the Instagram grid and the conundrum of how to meaningfully engage with social media. My solution, after a long social media hiatus, was to implement my free-flowing, gestural style with the myriad of images that pile up in my cellphone. This led to the idea of a never-ending, constantly evolving collage that grows each week with all of the images I come across in my travels through the city and on the internet; @infinite_canvas sparked my interest and research into the concept of perpetual change and alteration. The Infinite Canvas is an ongoing series of distinct works that revolve around the concept of perpetual, never-ending alteration. The Infinite Canvas No. 2 is the series' second installment and takes the form of a set of portraits that undergo perpetual alteration. Each stage of the portrait is marked by a change in medium which is documented and then put into an animated video file to show all of the changes from start to finish. In addition, a grid with all stages of the portraits is printed and hung alongside a projection of the video. A poster of the stages (up to 25) for a presentation of the piece at the end of Professor Weintraub's working critique class. DIAP Semester 1. The third installment of The Infinite Canvas bridges the gap between my research into our movement into our devices and my work in perpetual alteration. 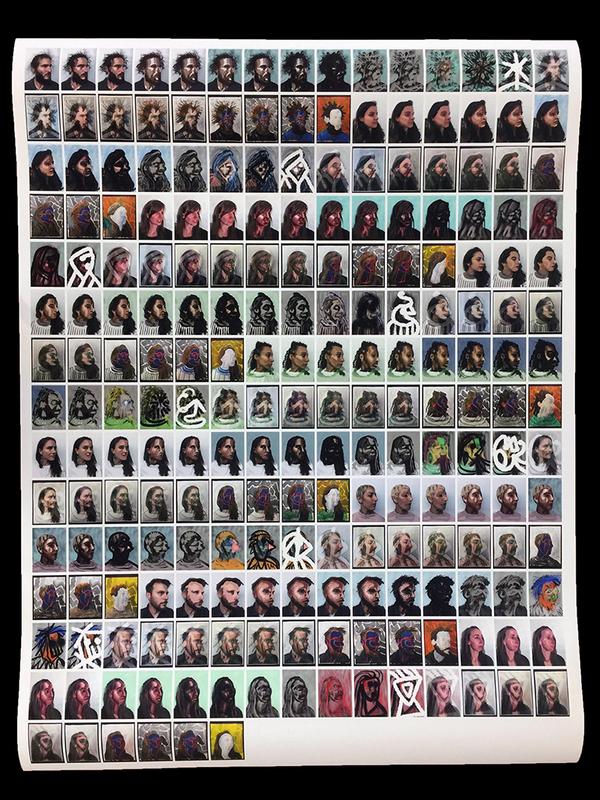 Conceived as a way to “paint with myself”, this work explores the splitting of personal identity as we digitize our lives. This first installment of the work features a projection of myself drawing the left hand side of a face, and then me drawing with that recording to finish the other side of the face; future installments will layer more and more ‘versions’ of myself into the recordings. Conceptual work with mock exhibition posters, writing and research on a website. The Digital Migration features my research into humanity’s collective movement into our devices and the false promises of technology. This project culminates in 5 proposals for exhibitions - with accompanying exhibition posters - surrounding these ideas. The concept of the digital migration is embodied in the image of man bent over, gazing down into a lit cellphone which blinds him to the outside world. A mock exhibition poster for "Two Phones in Conversation". A mock exhibition poster for "Awwwkward: The FaceTime Kiss". The Magical Moment is intended to be experienced in a small, empty room in the dark. Viewers are guided through a description of an exhibition that culminates in a rapturous experience with a famous painting that is never directly named. The Magical Moment oscillates between a critique of the institutions that supposedly deliver these rapturous art experiences and a legitimate yearning for a sublime moment. Four sample images of projection drawing. Lauren Shoemaker poses in all four shots. The two on the right are moving more to full body stills. At BANFF we aim to move into movement and start to develop a language between projection drawing and dance.